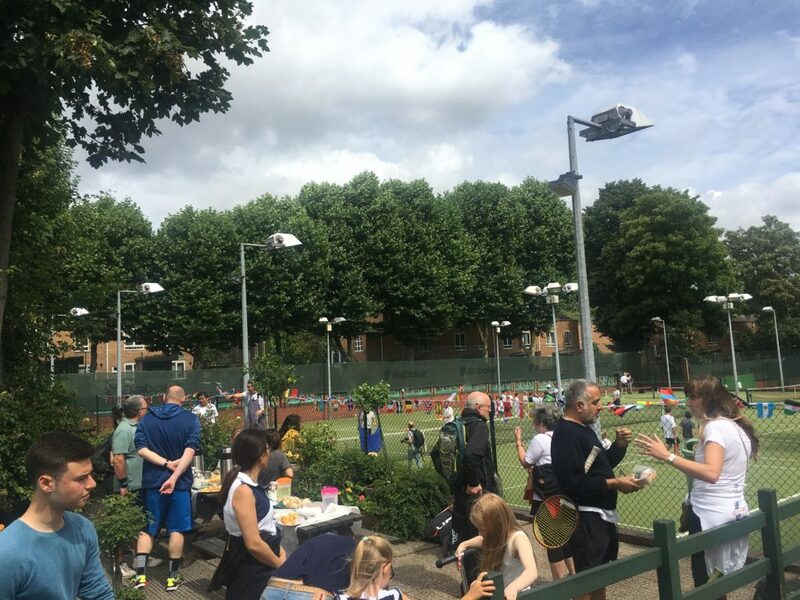 I went down to the Globe Lawn Tennis Club this lunchtime to meet them on their Open Day, in light of the threat to their continued existence. As discussed before, the Globe, located adjacent to the Russell Nurseries/Aspern Grove estate and Belsize Park tube station, leases the site from Camden Council. Instead of granting a long lease and offering the club security of tenure and peace of mind, Camden has offered only a lease with a break clause. This holds the sword of Damocles over the head of the club, and makes it difficult for it to plan longer-term. The club has 400 members and teaches a similar number of local schoolchildren: affording opportunities for sport and physical activity to a huge number of people that wouldn’t otherwise have it. And because of its particular ethos, including its founding commitment to openness, diversity, and pluralism, it particularly attracts people that would otherwise be more marginalised. This isn’t fundamentally an issue of housing, but I was interested to hear the members had been spun falsehoods about Camden’s housing situation to make it appear as though the case for building new homes on the Globe site was stronger than it is. They had been told that there are 27,000 people on Camden’s waiting list for social housing. While this was true under the old allocation scheme, that included thousands of people that either no longer lived in the borough or had found suitable accommodation. Once they were removed when the new allocation scheme came in in 2016, the list was just 6,000 long. Camden and its spokespeople should use the up-to-date figures to avoid misleading residents. I was pleased to see Cllr Paul Tomlinson there. Although he is from the other side of the aisle and he represents St Pancras & Somers Town, it is important that councillors of all parties from across the borough see for themselves the social outreach afforded by the Globe and its benefits to our borough. Sadly, he was the only Labour councillor I saw there, but hopefully, he can take the message back to his colleagues. I’ve given the dozens of people that have written to me an assurance that I would oppose any proposals to remove the Globe from their current site, and support granting a long lease without a break clause.